Please visit the autoFill Viewers to explore interactive models. This gallery contains inspirational images created by autoFill, Random experiments, and images that otherwise have no specific category on the website. HIV recipe 1.1 provides a "newer" model of HIV with clustered distribution of the spike proteins as described by Chognacki J, et al, Science Oct. 2012.
autoPACK running in PMV- gorgeous realtime interaction with SSAO (Screen Space Ambient Occlusion). Pardon the red/blue gradient used for testing in the video. Early 2011 Synaptic Vesicle Recipe showing a 100nm cubic section removed from C. Arthur's synaptic cleft tomogram. Molecular details modeled with autoCell and then printed on a Zcorp 3D printer. Extracted by Jon Huntoon and Photographed by Adam Gardiner of Art Olson's Molecular Graphics Lab at The Scripps Research Institute. Early 2011 Blood Plasma Recipe with a green Polio virus surrounded by visually desaturated blood plasma proteins. Demonstration of unwanted gradients produced by picking random objects to deposit as you walk through the grid in order. Depositing larger objects with a higher priority also results in unwanted gradients if the algorithm walks through the grid in order. Rendering this fill with a very thick depth-cuing fog shows just how sparse the proteins are in blood plasma ~6% of the volume. Pretty render of the a 2D cylinder fill test (stopped early) from an odd angle. 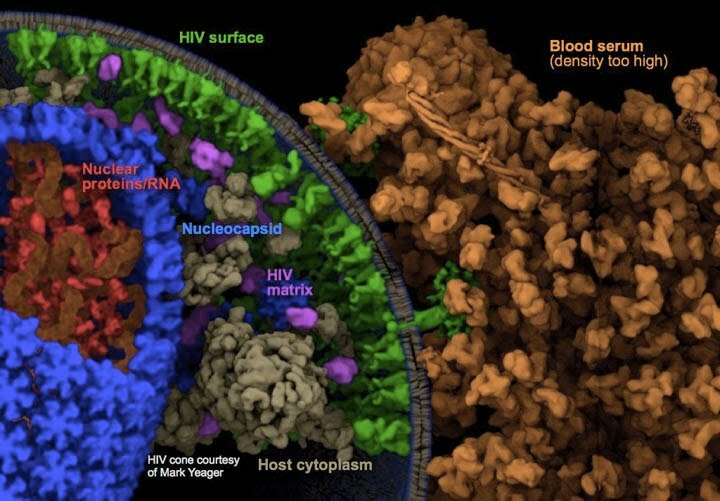 Early 2011 test to fill the interior of the HIV nucleocapsid with an RNA-sized fiber. The capsid comes from Mark Yeager's lab. Fibrous extension with AutoSpline running in COFFEE. We have versions integrated directly with PyAutoFill that can deposit objects and splines simultaneously.